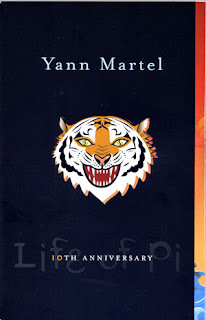 It’s difficult to believe that Yann Martel’s quirky little second book, the boy-meets-talking-tiger tale known as Life of Pi, was first published a decade ago. Canadian readers can now se e that date commemorated in a special 10th anniversary edition trade paperback from Vintage Canada. This was not the case with Life of Pi, a book that seemed to hum with its own special magic almost from the first moment, so that, by the time it won the Man Booker Prize in 2002, the world was ablaze with talking tiger fever. If you’ve not read the book yet, the anniversary edition will provide a terrific chance, something you’ll appreciate all the more when the film version comes to the big screen. The movie just started filming in India and Taiwan. Academy Award-winning director Ang Lee (Brokeback Mountain) is at the helm while an unknown Indian actor, 17-year-old Suraj Sharma, will star. The film is being shot in 3-D.
Who Is Yann Martel Teasing?